1898 R. H. & S. L. Plant (Ltd) R H & S L Plant were at the Tuscan Works, Forrister Street, Longton - it is not certain if they also continued at the Carlisle Works for a period. "This manufactory in the High Street, formerly belonged to the Bridgwoods, then to Cyples & Ball during 1847 and 1848, and from 1850 to Adams & Cooper. From 1881, it was carried on by R. H. Plant & Co. Formerly, Egyptian black, brown and luster ware, as well as china, was made, but china was later the exclusive product. 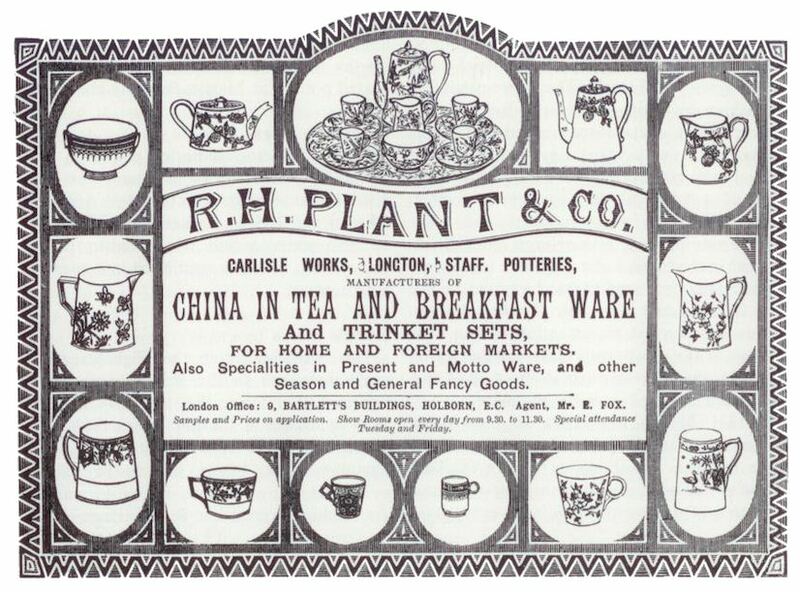 R. H. Plant & Co continued to 1898. From 1898 ... the firm has been R. H. & S. L. Plant (Ltd) of the Tuscan Works, Longton."